Powerful Bluetooth technology allows the Phonak ComPilot Air II to connect Phonak brand hearing aids to cell phones or virtually any Bluetooth-enabled audio device such as TV’s, computers, MP3 players and more for full stereo quality, binaural streaming. Small and compact in size, this streaming accessory includes a new integrated antenna and no longer requires a neckloop because it can attach directly to your clothing with a retaining clip for simple and easy hands free convenience. 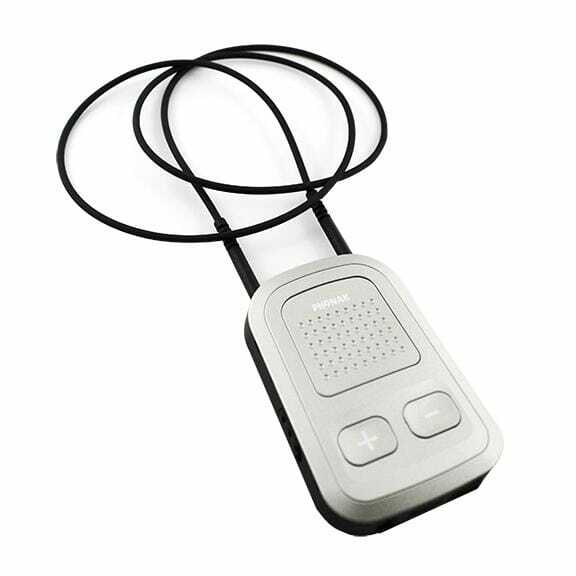 In addition to it’s streaming capabilities, the ComPilot II can also be used as a hand held remote control to remotely adjust your hearing aid volume and program settings to many different listening situations. Looking for a more convenient solution for a non-Bluetooth device. Then take a look at the Phonak TV Link II, which pairs your Phonak ComPilot II with audio devices through direct audio inputs located on the TV Link II. These two devices can be combined together into one purchase and save money with the ComPilot II TV Package. ComPilot II is compatible with the following Phonak instruments only. Direct backwards compatibility with hearing aids that previous ComPilot was compatible with should be not be assumed. If you do not see your hearing aid listed below, please call us to verify. NOTE: The ComPilot II unit must be paired with your hearing aids to function properly. This involves a software install and it is recommended to have your hearing aid provider perform this task to be sure it is done correctly so that the ComPilot II and hearing aid are communicating with each other as designed.